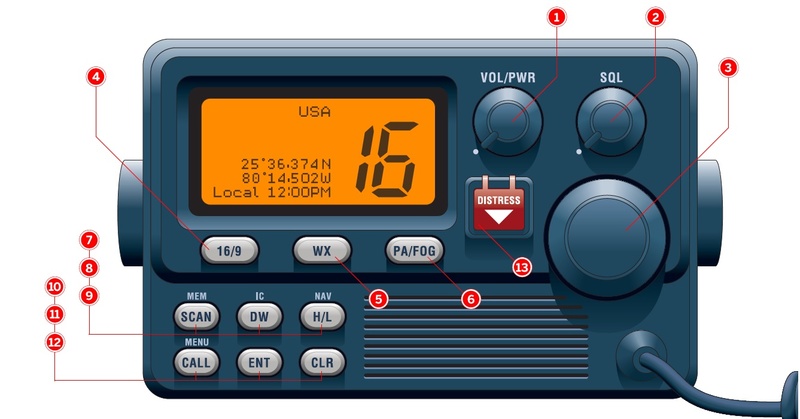 When it comes to communicating on a marine VHF (very high frequency) radio, there are no “Good buddies”, and no “Breaker 1-9s”. Smokey and the Bandit movies may have made CB radio jargon hip for a time, but a marine VHF is defiantly not a CB radio. It’s a serious piece of safety equipment that’s regulated by the FCC and the US Coast Guard. When used properly, it provides a critical communication link to potential rescuers in an emergency, access to NOAA weather forecasts, navigation alerts, and notices to mariners. It can also be used to hail a bridge tender on the ICW, communicate with passing ships, and even to invite the crew of a neighboring boat in an anchorage over for sundowners. Only boats over 62 feet are required to carry a VHF, but it’s prudent to carry one no matter what size boat. And no, carrying a cell phone is not a suitable alternative to VHF. Cell phones have limitations (range and power) that VHF radios do not. Of course the Coast Guard will answer distress calls made on a cell phone, but prefers to receive coastal distress calls via VHF. The following is a primer on most VHF features and how to use them, proper distress call technique, picking up weather forecasts, and generally how to navigate the VHF radio waves. But before we begin, there are several things to remember. First, VHF radios are toys. Don’t talk like a trucker on a CB, don’t clog important channels with idle chatter, and NEVER, NEVER make a false Mayday call. You can be prosecuted and be potentially putting lives at risk. Second, always monitor channel 16. If you receive a distress call, record it and your position in your log, and be prepared to render assistance if possible. Third, when sending a message make sure to press the handset’s trigger, speak into the microphone, speak slowly, and clearly. Use the phonetic alphabet to spell important information out and always confirm a received message. Also, always wait to attempt to hail another user until the hailing channel is inactive. Breaking into an active radio transmission is bad VHF etiquette at best and could possibly put lives in danger at worst. When hailing another boat, establish contact then quickly switch to an established working channel. Never use profanity, always make transmissions using minimum power, keep conversations as brief as possible, and remember that most VHF calls are audible to any radio in range that is monitoring your channel, so watch what you say. You never really know who’s listening. Make sure you and your radio’s FCC licenses are up to date, and last but not least. Never say “Over and Out” at the end of a transmission. “Over” means you are done speaking. “Out” means your done transmitting. When you’ve completed your conversation just say “Out.” Same holds true for “Roger, Wilco”. Nothing says “VHF rookie” like “Roger, Wilco” followed by “Over and Out”. Many of us can stumble through a VHF transmission, but who is willing to admit they don’t know what all those other buttons and knobs do? Now you’ll know. 3. Channel selector—a knob or button that’s used to select channels and choose menu items such as DSC and radio setup. This selector can also be used to confirm memory channels. 5. WX—A quick press of this button immediately recalls a selected NOAA weather channel from any channel. On many radios, holding the 16/9 key while pressing the WX key changes the radio from USA, International, and Canadian channel groups. Switching channel groups is required for the best reception when the boat moves from one region into another. Correct hailing procedure is to state the name boat you are hailing (usually on channel 16), then the name of your boat followed by “over”. Over tells the other party you are done speaking. This is important because if both radio operators push their mikes at the same time, neither will be heard. Only one party may speak at a time. Any other words like “yoo hoo” and “Is anybody out there?” is incorrect procedure. Once you’ve established contact, switch to a working channel. Once you’ve switched to a working channel say the name of the boat you are hailing followed by name of your boat. At the end of your conversation say your boat name, “Out” or “Out, your boat name back to 16”. Mayday: Is a request for immediate assistance due to an “imminent” life threatening situation. If you hear a mayday call, listen, do not transmit. Determine if you are in a position to assist. If not maintain radio silence. Pan-Pan: Announces an emergency when the safety of a boat and/or persons are in jeopardy but not in “imminent” danger. Man overboard calls are sent with the Pan-Pan signal. As with a Mayday call, listen to the Pan-Pan, determine if you are in a position to assist, and keep radio silence if not. If you find yourself in an imminent life threatening situation make sure the radio is tuned to channel 16 and make the following radio transmission. Try not to panic and speak clearly. 1. Press the mike and say “Mayday, Mayday, Mayday. This is (name of your boat repeated three times). 2. Repeat Mayday (this is boat name) one more time. 7. 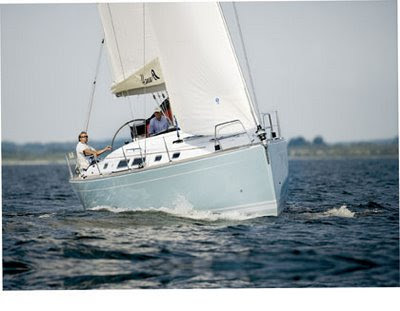 Describe the boat (length, design color, distinguishing marks) and its seaworthiness. Total message should not exceed 1 minute. Substitute “Pan-Pan” for Mayday in an emergency where there is no imminent danger to the boat or persons on board. 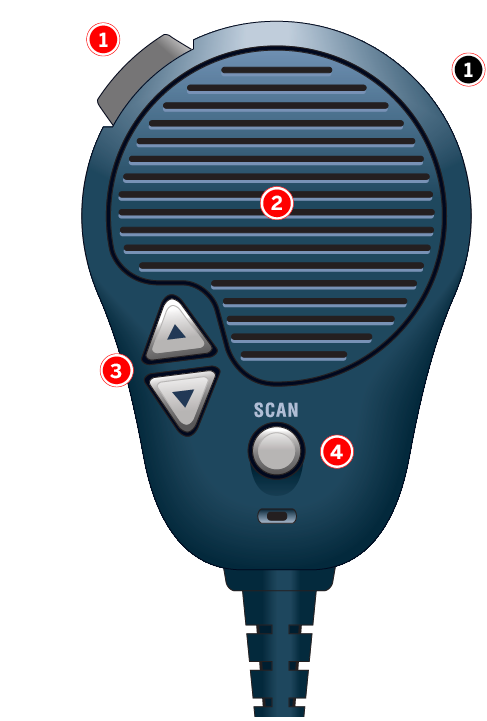 DSC is a semi-automated method of establishing a radio call simply by pushing the “Distress” button. When the DSC button is activated, the radio automatically sends a distress call with GPS position (when a GPS is connected to the transceiver), and the nature of the distress to the Coast Guard and other vessels within range of the transmission. It also scans the appropriate channels for a response. DSC also allows users to immediately receive distress, urgent, safety, routine, position requests, and group calls from other DSC equipped transceivers within range. 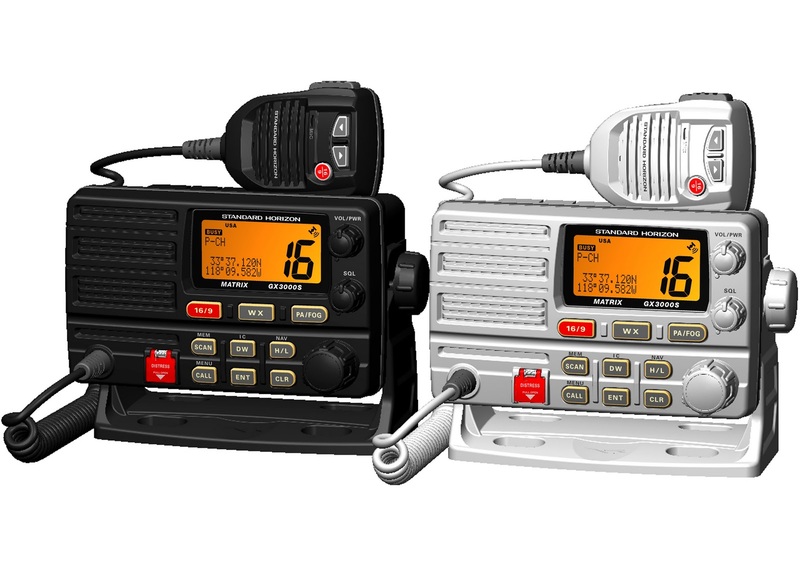 Every radio equipped with DSC has a Maritime Mobile Service Identity (MMSI) number assigned to it. A radio’s MMSI is a unique 9 digit number (similar to a telephone number) that must be programmed into the radio to operate the DSC functions. 1. Lift the protective cover over the “Distress” button, press and hold it until the radio’s display shows that the call has been sent. 3. The transceiver will automatically monitor Ch 70 for a DSC acknowledgement and also receive calls on Ch 16. 4. If no DSC acknowledgement is received, the transceiver repeats the distress call at 4 minute intervals until acknowledgement is received. This is the distress, safety, and calling (hailing) frequency the US Coast Guard monitors continuously. All vessels equipped with a VHF must monitor Ch 16 and be prepared to assist in an emergency. Would be nice to read an updated version with the Digital Selective Calling facility of modern marine VHF transceivers. Most importantly the correct use of the red Distress alert button and the subsequent voice trafic with the coastgauard. My Marine VHF Radio Handbook provides seafarers with easy-to-follow guidance on these matters. Having sailed on International waters for over two decades, I must say that I disagree with your “never say Over and Out”! If you are closing off a conversation and don’t expect to be monitoring that particular channel, (as in switching off your radio), please don’t be shy of saying “Over and Out” if you do plan to stop monitoring that channel, so as to let the others listening know that you are no more keeping watch on that channel. Of course, depending on your size of the vessel and your local port obligations you may need to still monitor a particular channel. However, saying “Over and Out” when you mean to close off a conversation, specially at signal strengths 1 to 3, is not incorrect.